Note: exact design will vary. Colors and specific design may vary. Painted plaster sculpture in painted wood box (colors and specific design may vary). (9 1/2" h. x 8" w. x 3" d.). Exact design and colors may vary. Painted plaster sculpture in painted wood box. Each retablo is unique. Individual designs will vary. (Exact colors and design will vary). 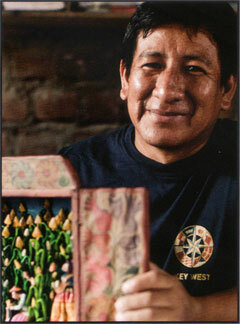 Mabilon Jimenez Quispe, as profiled in HAND/EYE Magazine (#08), in the article "Small Worlds", by Colvin English, Summer 2012. Photograph by Musuk Nolte.